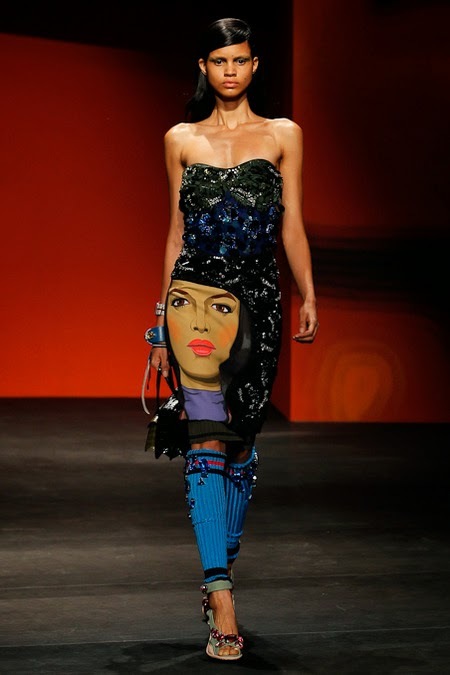 Indigenous Brazilian newcomer Mariana Santana emerged as the true dark horse of the Spring/Summer 2014 collections with appearances at Anna Sui and Creatures of the Wind during New York Fashion Week, followed by a wave of unprecedented interest on the most lucrative of European runways. An exclusive appearance at Prada in Milan set the wheels in motion for a dream run throughout the Paris collections with Santana landing the Holy Grail of runway bookings at Givenchy, Céline, Dries Van Noten, Alexander McQueen, and Christian Dior. Twenty year old Santana's success is a testament to her strikingly rare beauty and the power of a formidable management team at Elite NYC that believes in developing its talent to their full glowing potential. Standing at a statuesque 180 cm with unruly dark tresses and brooding puppy dog brown eyes, Santana possess a combination of undeniable commercial accessibility tempered by a somnambulant high fashion edge. 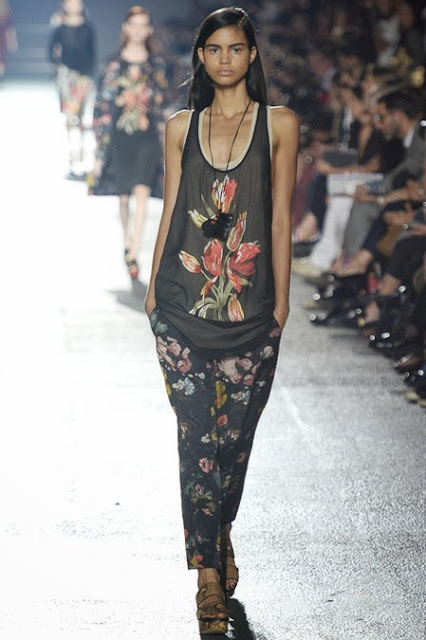 Discovered at age 17 in her native Salavador Bahia, Santana's dark smouldering looks quickly found relevance on the New York show circuit with commercial clients; Rachel Comey, Suno, Tracy Reese, Erin Fetherston, Dennis Basso, and Wes Gordon, and in campaign gigs for Rugby Ralph Lauren and Free People. Despite glowing praise from models.com founder Wayne Sterling via the Imagist, "Here are the long body lines that the catwalk clique loves to play with. Here is the 'fresh-out-of-the-shower' beauty that contracts can be built around and here is the hint of curves that truly amplify a sell. 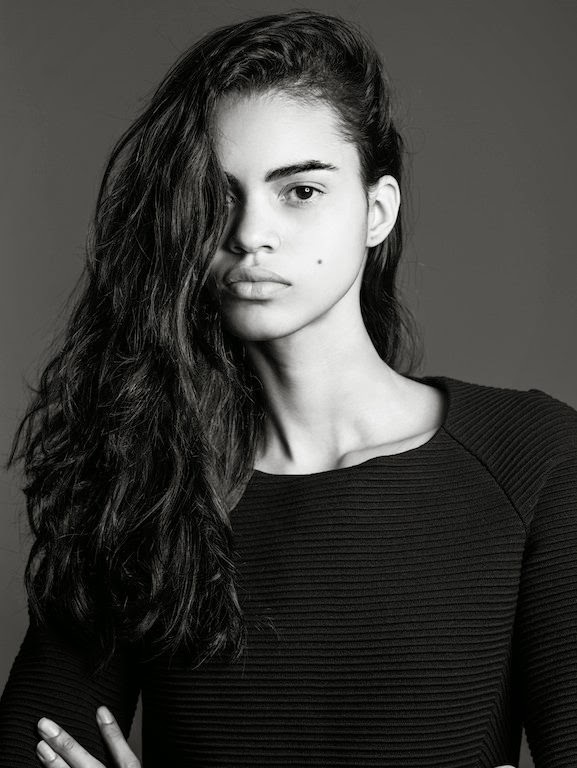 At 17, she's mature enough to go full momentum into the market and I can't wait to see what her breaking bookings all be", Santana's options remained firmly entrenched in modelling's commercial realm. In 2012 a discernible shift in Santana and her modelling trajectory was precipitated by a change in representation to Elite Model Management NYC. Fast-forward to the Spring/Summer 2014 season and Santana has experienced what can only be described as a rebirth with high fashion denizens proclaiming her as one of their one of their own on the runways that mattered most. IMA caught up with Santana following the Spring/Summer 2014 collections to celebrate her stunning high fashion metamorphosis, the power of self-belief, and the true meaning of diversity. Inoubliable Model Army (IMA): Hi Mariana, congratulations! You must be on Cloud Nine following an amazing Spring/Summer 2014 show season! How are you feeling now that you've had time to decompress and take stock of your achievements over the past month? MS: I feel quite satisfied and grateful to every person who was essential in supporting me with such an exciting and successful season! MS: I'm 20 years old. I was born and grew up in Salvador-Bahia, northeast of Brasil. Most of my family comes from a small town in Bahia where our native tribe was located. I was discovered by scouts in my hometown. 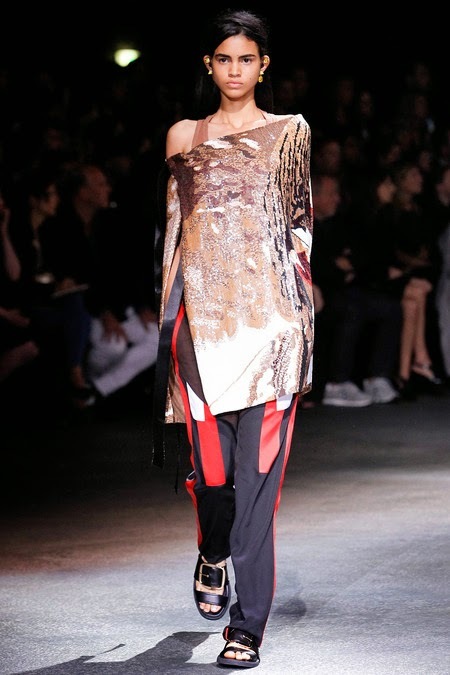 IMA: Your Spring/Summer 2014 show list was nothing short of EPIC with a concise grouping of eight ultra-blue chip bookings including Céline, Alexander McQueen, Givenchy, Christian Dior, Dries Van Noten, Anna Sui, and a Prada exclusive! What do you feel were the key factors which have led to this major breakthrough moment for you this season? MS: The key factor was changing representation to Elite NYC. Elite NYC really understood me, were passionate, and worked very hard in every way. IMA: New York City like Brasil is a cultural melting pot. Being based in New York, what do you appreciate most about this metropolis? MS: It's a pleasure to observe the harmonious integration of the different cultures that coexist here in New York. IMA: Diversity was on the minds of many casting directors for Spring/Summer 2014. Did you notice greater diversity this season backstage during the shows and at castings? How does it feel to be part of this exciting new collective of coloured models who are bringing diversity back to fashion's runways? MS: It's a coloured sensation! Diversity is an expression of love without hurdles. I loved being part of this moment. IMA: Let's get back to that Prada exclusive. When did you find out that you had been confirmed for the show and what was your initial reaction? MS: My agency Elite NYC contacted me a couple of days before the show. I was so excited to hear the news that I would be flying on the next plane for the Prada exclusivity. It was a dream come true! IMA: In 2012, you changed representation to Elite Model Management NYC. How has Elite NYC been instrumental in guiding your career trajectory to this pivotal moment? What is the most valuable piece of advice that your agent has imparted to you? MS: Elite NYC is an agency that really pays attention to their models. The team really takes care of every detail needed for me to achieve successful results. My agent is always reminding me to stay calm and to be positive! IMA: What do you enjoy most about being a model? MS: Travelling and meeting awesome people all over the world. IMA: You have two distinctive beauty spots on your left cheek and forehead which have since become part of your defining look. Was there ever a stage where you felt pressured to have them removed to conform to a more standardised concept of beauty? MS: When I was in middle school, I heard many bad comments about my beauty spots. About my whole appearance, actually. I didn't want to follow the concept of beauty that my classmates expected from me. I'm happy I didn't follow them, and I love that I'm being recognised for who I am.